JFW offers a wide range of RF power dividers and RF power combiners using a variety of technologies. 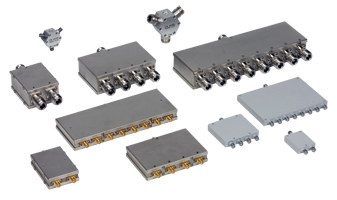 Our diversified approach allows us to provide a divider, combiner and/or RF splitter solution to meet the needs of almost any OEM, system integration, laboratory or field environment. Whether you are looking for a low cost power divider that is in stock or a customized solution designed specifically with your application in mind, JFW can help.